The trachea and the esophagus are two distinct connecting organs. They are part of different body systems and they perform important roles. Mixing one with the other in a conversation is no big deal as long as you stand corrected. But you surely don’t want your doctor to do that! Find out why in the article. The trachea is a connecting organ also known as the windpipe. It is part of the respiratory system, connecting the larynx with the lungs. 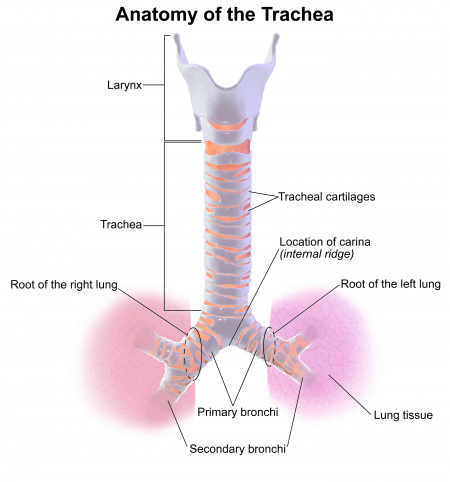 The trachea runs behind the sternum and splits into the two bronchi (one for each lung) as it descends. It is a cartilaginous tube made up of 20 rings, at the back of which are muscles and connective tissues. The inside is lined with an epithelium that moistens and protects the airways. The most common medical conditions involving the trachea include having a foreign body stuck inside and obstructing the flow of air, inflammation, and a tracheoesophageal fistula (the formation of a channel from the trachea to the esophagus, taking food through the respiratory system instead of the digestive one). Tracheal cancer cases are rather rare. The esophagus is a muscular organ also known as the food pipe or gullet. It acts as a connecting tube between the pharynx (throat) and the stomach, transporting food from one point to the other. It is located behind the trachea in the thoracic area of the body. 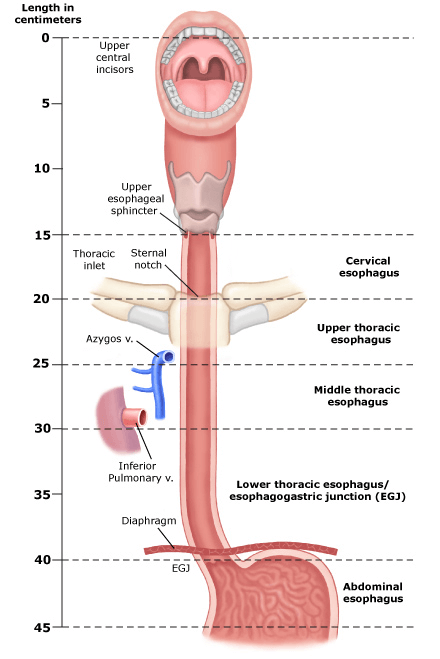 The esophagus has four parts: the cervical, the upper thoracic, the middle thoracic, and the lower thoracic esophagus. It is 8 inches long and lined with a pink epithelium to protect it against injuries caused by food traveling to the stomach. Right before the first segment of the esophagus there is the upper esophageal sphincter, a group of muscles that controls breathing, eating, vomiting, and belching. This is the organ that does not allow food to travel down airways. At the other end of the esophagus there is the lower esophageal sphincter which stops acid and stomach content from traveling back. This group of muscles cannot be consciously controlled the same as the upper one. Common medical conditions surrounding the esophagus include heartburn and gastroaesophageal reflux disease (both refer to acid traveling up from the stomach), inflammation, ulcers, and even cancer. So what is the difference between the trachea and esophagus? The main difference between the two lies with the fact that the trachea is part of the respiratory system while the esophagus is part of the digestive system. The trachea connects the voice box (larynx) to the lungs. The esophagus connects the pharynx to the stomach. The trachea is a tube made out of 20 cartilaginous rings which divides into the two bronchi. The esophagus has two muscle groups at each end to control food going down and to keep it from coming back up. Also, the trachea runs down behind the sternum and the esophagus is right behind it. Common medical conditions of the trachea are inflammation, getting an object stuck inside, the formation of a fistula connecting to the esophagus, and, in rare cases, cancer. For the esophagus, the most common medical conditions include gastroesophageal reflux, heartburn, inflammation, ulcers, and cancer.